The UK’s Economic Research Council invited me to represent LSE in a panel discussion on near-term prospects for the UK economy. Lord Norman Lamont, 1990-1993 Chancellor of the Exchequer, chaired. The other panelists were Prof John Muellbauer from Oxford and Prof Hashem Pesaran from Cambridge. The venue? The Royal Institution of Great Britain’s Faraday Lecture Theatre, where in 1825 the first of the Royal Institution Christmas Lectures were delivered. First, the economic difficulties in the UK or the Eurozone cannot be usefully analysed without looking at these economies’ positions in the world. Second, the UK and the Eurozone have an immediate problem with debt and an ongoing problem with productivity. It is unlikely that Keynesian aggregate demand management alone will lead to long-run sustained growth. What are the facts on the UK and the Eurozone in the global economy? But that was 30 years ago, and the global economy has moved on. By 2010 the world’s economic centre had shifted 5,000 km — three-quarters of the Earth’s radius — from the rise of the east, notably India and China. As a consequence, hundreds of millions of Asians have been lifted out of grinding poverty; soon these people will be the world’s middle income class. That figure of the Great Shift East takes in grubby calculations with thousands of datapoints. 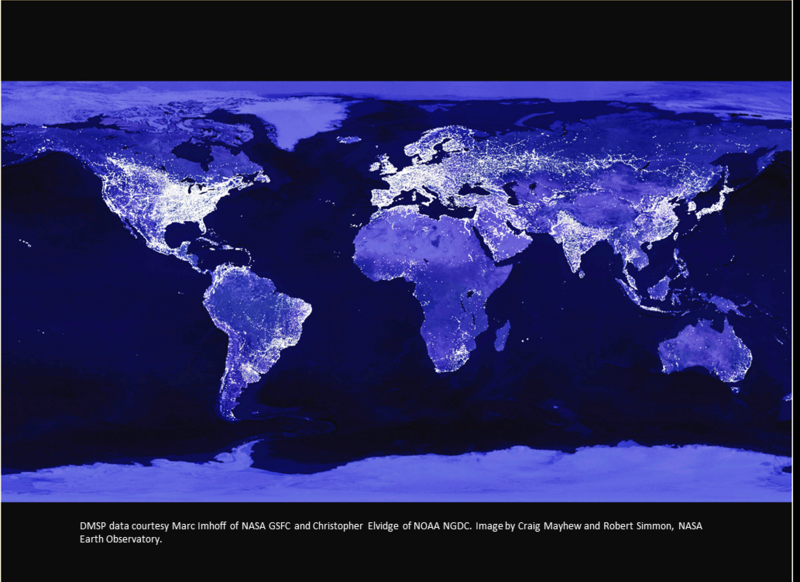 But its point can be appreciated in many different ways, some more vivid than others (e.g., view from the US). The great bulk of German trade remains, naturally, with the rest of the European Union. But the EU is now deep in recession and likely to remain so for some time. Outside the EU? 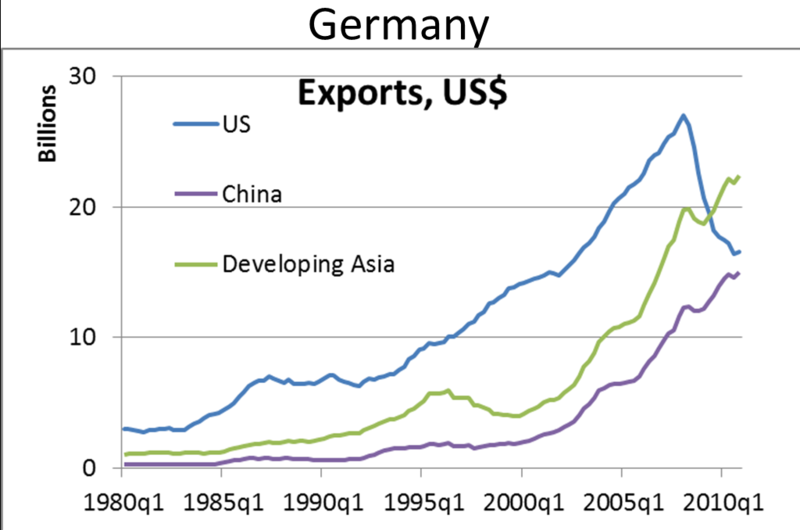 Germany today exports more to Developing Asia than it does to the US. And that gap continues to rise. Exports to China alone already appear as large as those to the US. Part of this obviously stems from US imports sharply falling right after 2008 — but that is exactly my point. China and Developing Asia continued to grow, continued to import from Germany (and elsewhere), and thus continued to keep parts of the global economy afloat throughout both the global financial and European sovereign debt crises. 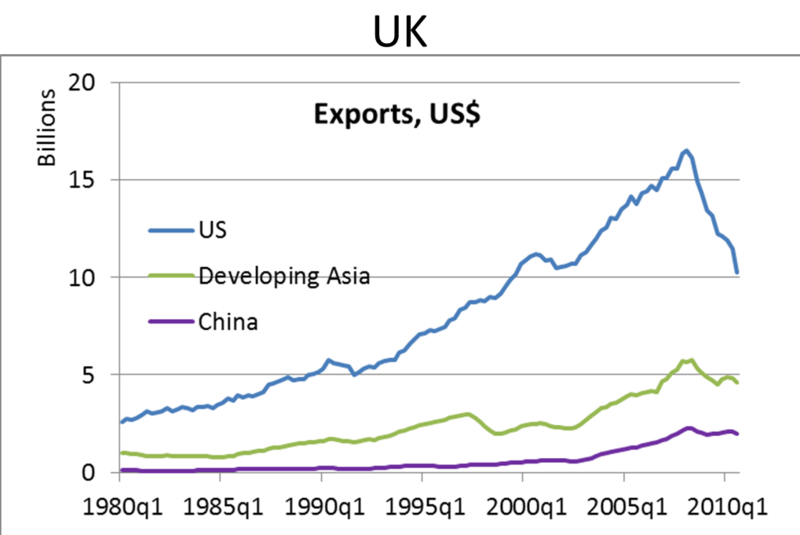 What the UK exports to the US remain double UK exports to Developing Asia, and four times UK exports to China. The UK has simply ended up with most of its exports to economies showing no significant demand growth. Unpack the numbers further by breaking out the UK’s 50 largest trading partners in 2009: the UK had 56% of its exports go to the 10 slowest-growing economies in that group (growth measured 2000-2008). Across these 50, the correlation between exports and growth was -0.32: the UK systematically exported more to those trading partners growing slower. The problems faced by the UK, or more broadly, by member states across the entire EU, while different in concentration, are no different in character from those in the 2008 Global Financial Crisis: Large entities owe large amounts of debt and are likely unable to pay it all back. Previously, the entities were financial institutions; now they are sovereign states. Quick fixes that seek to get around repaying this debt will undermine institutions of trust and responsibility, those same institutions the West tells emerging economies they must build if they too want to become developed economies. When the first round of Quantitative Easing (QE1) happened in the US, output there rose — and to a smaller extent elsewhere in the world as well. With QE2, IMF estimates show the impact multipliers everywhere had diminished sharply. Now? There are those who hope a rescue will come when the ECB unleashes its own QE on Eurozone sovereign debt. Or some optimistically-ingenious scheme involving different-coloured centrally issued Eurobonds, or where the discrimination occurs across member states using some other indicator might work. With luck perhaps. Longer term, some observers look to a fuller-fledged fiscal union, with Germany transferring likely more than 5% of its GDP to the Eurozone’s lesser-performing periphery member states (link: Gavyn Davies, FT, 06 November 2011 ). But the connection between this re-organization and member states’ fiscal positions cannot be ignored. While all attention now focuses on deficit/debt figures compared to those originally given in the Maastricht Treaty, pretty much totally neglected is the nearly-contemporaneous Copenhagen criteria for EU accession. That list includes — after requiring member states be democracies that obey the rule of law, respect human rights, and protect minorities — the statement that candidate member states need to be market economies able to deal with “competitive pressure and market forces within the Union”. Monetary or other financial rescues are short-term; we need them the same way we need to kickstart an engine. But if that engine is worn out or is leaking fuel or in need of a complete overhaul, I don’t see how we are going to get very far with that machine. We can’t mistake a short-term boom fueled by exigent government actions for sustained long-term growth. Again, isn’t this what the West tells emerging economies? Reboot the UK economy: Take the pain and turn around to engage fully with the emerging economies; do business with them as economic partner — no more, no less. The emerging economies are now the world’s engine of growth: Deal with it. Unleash our universities and other thoughtful, creative industries. This is NOT to raise government spending, but just to free up extant restrictions on their operations. UK higher education is hugely in demand by the emerging economies. 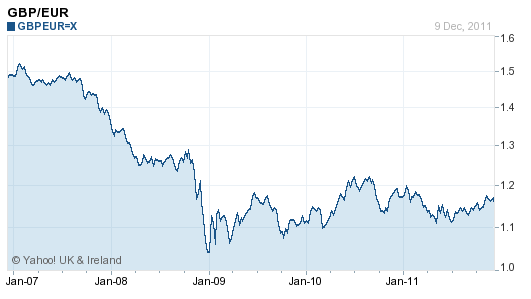 If there’s anything that’s going to help re-balance the global economy, this is it. Throw out long-standing aesthetics and principles – they’re also called prejudices. Become enamoured of what works — whether it’s guided capitalism under a bit of state control or anything else we previously thought completely nuts (i.e., outside the Washington Consensus). Celebrate the virtues of working hard, raising productivity, saving for the future — not revile them as many do today for Germany or used to do most obviously recently only for China (and yet might come back to doing so again soon). This post originally appeared at Danny Quah’s Blog and is posted with permission.